Description: The new ATFE headquarters building was designed to the highest security standards. Other major drivers of the design approach included operational functionality, energy efficiency, long-term flexibility, and redundancy. In addition to flexible office environments, major program elements in the 400,000 sf building include a 300-seat theater, 20,000 sf of training classrooms, laboratory space, a fitness center, a cafeteria, and structured parking. Cosentini designed and implemented an underfloor supply air distribution (UFSAD) system that allows occupant control, lowers fan energy consumption, and is a means of wire management for low-voltage and power-wiring systems. Electrical power and telecommunications wiring are distributed beneath the raised floor, organized in modules to provide flexibility and enhance cable management. 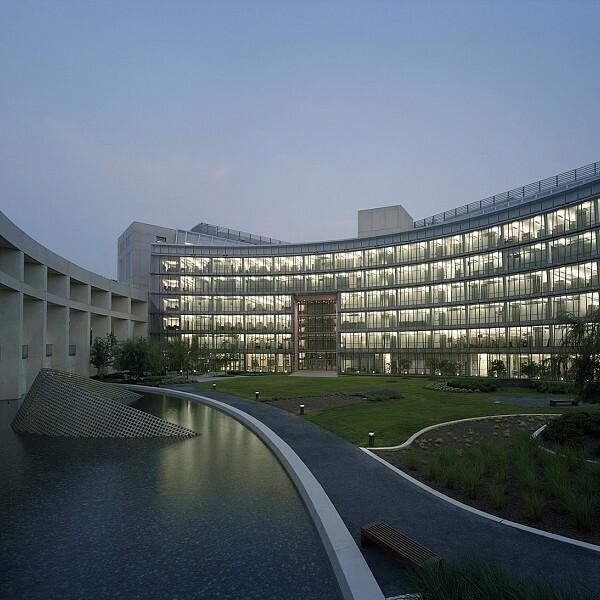 High-performance glazing admits natural light to minimize interior lighting demands. The façade design allows for natural ventilation via two layers of exterior glazing that reduce solar and heat gain while providing a space to route relief air from the air-handling systems. Several other sustainable design features include bio-swales to filter parking lot surface drainage, water-conserving plumbing fixtures, and premium-efficiency refrigeration machines in the central chilling plant. Lighting systems provide required lighting levels within the open-plan spaces while reducing energy use, and also incorporate daylight controls to reduce artificial lighting use when adequate ambient light is available. Narrow floor plates surrounding a central atrium bring daylight into the office spaces, and task lighting is provided as necessary at each workstation.